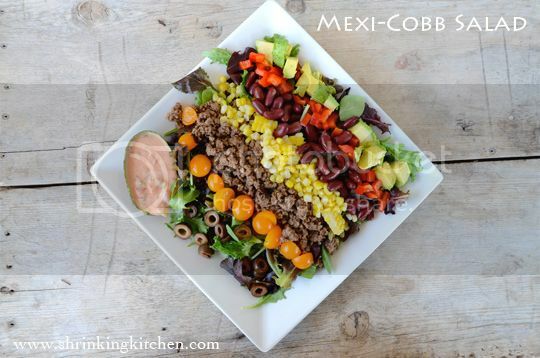 A great alternative to Taco Night, this Mexi-Cobb Salad is hearty enough to satisfy the rumbliest tummies, and beautiful enough to impress your dinner guests! Call all of your girlfriends, whip up a batch of margaritas, chase the kids off, and have a girls night in complete with Antonio Banderas movies. Picky eaters who don’t like salad? No problem! Just throw some tortilla chips on the plate in lieu of lettuce and call it nachos! The thing I love most about this salad (besides the fact that it tastes so wonderful) is that it can be completely customized. Throw on a little Queso Fresco or shredded jack cheese, or crumble some tortilla chips on top. Have leftover grilled chicken or steak? Use that instead of ground beef. No kidney beans? Use pinto or black. A hearty salad big enough to count as a meal! Brown ground beef in heavy skillet on stove. Add taco seasoning according to package. Set aside. Dice bell pepper an avocado. Plate: lettuce covering plate, then stripes of each topping dividing equally among 4 plates. Mix salsa and sour cream together to make dressing and drizzle on top of each salad.